Do you remember Cassy? 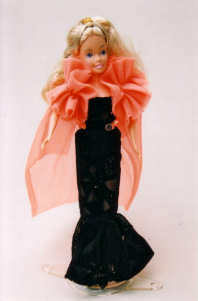 Cassy was an innovative little doll who became popular in the early 1990s, manufactured by the Hornby company. A few years before, Hornby had enjoyed a huge success with their Flower Fairies – dainty dolls who inhabited their own small world – and obviously, they hoped to do the same with Cassy.She was released amidst a torrent of publicity in 1992; slim, petite and just seven-and-a-half inches tall. Cassy was available with assorted hair colours and styles – sometimes her hair was long and sleek, and sometimes it was worn in a thick mass of curls. On special occasions it was piled high on top of her head in a kind of beehive style. Her pretty face featured painted blue eyes which looked straight ahead, a tapered chin and pale lips. The back of her neck was marked ‘Hornby 1991′. Cassy’s facial expression varied, and the Hornby brochure declared ‘Her moods are reflected in many differing expressions, from broad smiles to that unique, pensive look.’ The doll was fully poseable with joints at the neck, shoulders, hips, knees and waist, enabling her to sit, bend, straddle a pony or assume graceful ballet positions. However, the most innovative thing about this little doll, and the reason for her name, Cassy, was her unusual packaging – she arrived inside a transparent cassette, similar to the kind of boxes used to hold video tapes. Alongside the doll were a brush and a stand as well as a colourful backing card printed with a room setting. 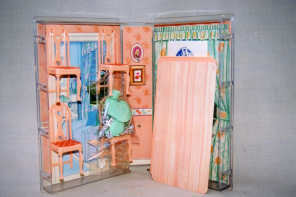 It was also possible to purchase sets of furniture for the doll, packaged into cassettes. This furniture was well-made from plastic, and often featured light or sound. The cassette cases were not just a practical gimmick for shop display purposes – they could be clipped together to build up into a large play-set, a brilliant marketing ploy, as the more you bought, the bigger the house for your Cassy dolls! Each cassette measured ten inches tall by six inches wide, and was hinged, just like a normal video case. Bases and roofs were sold to make the cassette-houses more realistic. These bases were complete with decorative edging and fencing, and they ensured that the structure was firm. Pretty pink roofs provided the finishing touch. Everything was held together with plastic clips to make a sturdy and versatile structure. In addition to the small cassette packs, it was possible to buy large boxed sets such as a ballet studio, disco, house, riding school or, the ultimate, Cassy’s country home – it saved time to get them this way, rather than gradually buying the individual cassette units. These boxed sets contained additional features, including dolls in special costumes. The disco contained a dj’s console with flashing lights and a Cassy doll dressed in a metallic-look jacket over a purple catsuit, while the balle t studio pack came with a roof, base, and two cassettes containing a barre, a mirror and a Cassy wearing a delicate lilac tutu. The stable set was enormous fun, because the horse-trough was fitted with tiny red buttons, which, when pressed, enabled you to hear the horses walking, whinnying and huffing. 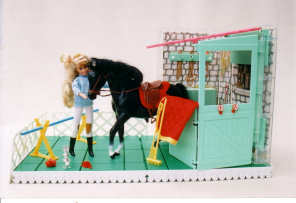 It came with plenty of accessories such as tack, brushes, rosettes, and an all-important broom and rake to enable Cassy to muck out Stroller, her palomino horse. Without doubt, Cassy was a young lady from a wealthy family; her lifestyle was reflected in the lilac quilted satin draped bed, gold plated bath taps, and dining table set with ornate silver cutlery and candelabra. She had a fully-equipped kitchen which included a microwave oven. Buttons on the hob of her glass-fronted cooker pinged the microwave, or made the sound of food frying, while buttons on the fridge caused the phone to ring and the food processor to whirr. Her top-of -the-range country house was a huge double-gabled building, with two attics and a stable, featuring plenty of lights and sound. As with the other buildings, this could be purchased all in one go, or built up from the various cassette units, and the ingenious design meant that all the fittings, even the lights, could be repositioned. Everything folded down and clipped neatly inside its cassette, ensuring that small accessories were kept safe. Cassy’s clothes were superb, especially her evening dresses and disco outfits. Everything was well-detailed, and made from fine, colourful fabrics, often floaty chiffons, sparkly lurex or layers of net. Even the ballet tutus were trimmed with narrow satin ribbon, and their skirts were of finely pleated net over white, lilac, or turquoise leotards. Many of the outfits featured a novel characteristic – an unusual puff sleeve on the right arm, the left arm being bare. This could be seen in all the tutus, as well as in several dresses such as a full-length silver gown in the ‘Special Occasion’ range, with detachable pink and purple chiffon panels. A froth of chiffon was gathered on the right shoulder, while an unusual finishing touch was the narrow pink and mauve plait fastened across the top of Cassy’s head, to match the dress. Some of her most elegant outfits were the sheath-type fitted gowns which flared below the knee, and the lavish, silky ballgowns. When she went to the disco, Cassy opted for a gold lame mini with pink satin overskirt, a silver and black dotted jacket worn with a swirly cerise skirt, a gold and black shimmering dress with fitted bodice and full skirt or a blue handkerchief-pointed spot net dress with a navy bodice. A purple catsuit was included in with the disco studio. She adored colour – her casual clothes were in shades of orange, pink or purple, and of course, being the early nineties, she was the height of fashion in her pink and green shell suit! Outfits could also be bought separately, in blister packs, which often also contained a plastic easy-to-dress ‘mannequin’, which allowed the garment to be displayed if required. Packs of hats, shoes and other small accessories could be purchased too. 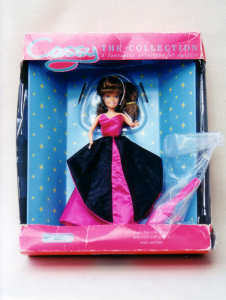 A few Cassy dolls were sold in cello-fronted cardboard boxes, as opposed to the plastic cassettes, while, later, when the range was being wound up, packs appeared with Cassy in the wrong outfit, or packaged in with accessories. Cassy was a busy girl because she had four foals to look after, as well as several horses. When she went riding she could choose from Beauty (black), Stroller (palomino), Snowdrop (white),Conker (brown), Ebony (black) or Sandancer (another palomino). Her riding outfits included pale blue, bright yellow or scarlet jumpers or a grey or brown hacking jacket, all worn with jodhpurs. Sometimes she rode a very special black horse called Jet, who could be made to neigh or huff by means of little buttons under the saddle, and it’s tempting to wonder how many little equestrians furtively felt under their pony’s saddle, on the off-chance that their mount might be equally equipped! Cassy also participated in gymkhanas, show-ju mping or cross country events. 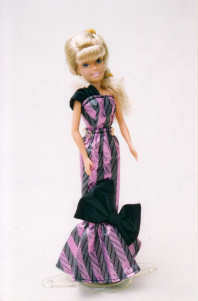 Today, Cassy’s sweet face, petite figure and elegant dresses make her popular with collectors. Her small size means that she is perfect to display when space is at a premium, and her colourful outfits are very appealing. Maybe soon, Cassy will be as sought after as the Flower Fairies, Hornby’s earlier series of dainty dolls.